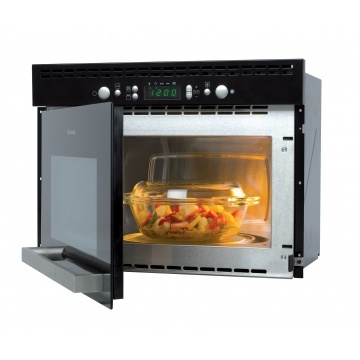 Dometic Built-in Microwave With Grill is essential to any modern motorhome kitchen, In addition to the useful timer, clock and pause button; the Dometic MW 13 offers a quick-start function for fast heat-up of soups and beverages as well as a practical cool-down function, which cools down the food to a pleasant eating temperature and automatically turns the oven off after use. Specially developed for fitting in caravans & recreational vehicles. The first fully-integrated microwave for caravans & motorhomes. 3D dual emission system: even heating up of meals without cold spots. Voltage 230 / 240 volts AC. Power rating of 750 watts, or 1200 watts when the grill is used. Functions pause/stop function: for halting or stopping the heating process. Grill function: for baked dishes and grilling food. Timer function with clock and audible signal: for precise timing when preparing food. Jet defrost function: extremely fast and thorough defrosting of food - up to 85 % faster than conventional defrosting functions.